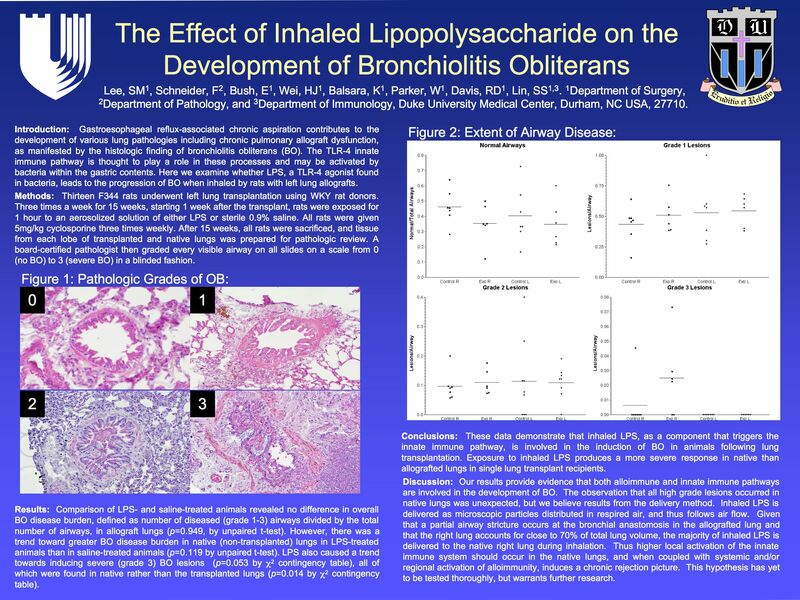 The Effect of Inhaled Lps on the Development of Bronchiolitis Obliterans. Introduction: Gastroesophageal reflux-associated chronic aspiration contributes to the development of various lung disease processes including chronic pulmonary allograft dysfunction, as manifested by the histologic finding of bronchiolitis obliterans (BO). The TLR-4 innate immune pathway is thought to play a role in these processes and may be activated by bacteria within the gastric contents. Here we examine whether LPS, a TLR-4 agonist found in bacteria, leads to the progression of BO when inhaled by rats with left lung allografts. Methods: Thirteen F344 rats underwent left lung transplantation using WKY rat donors. Three times a week for 15 weeks, starting 1 week after the transplant, rats were exposed for 1 hour to an aerosolized solution of either LPS or sterile 0.9% saline. All rats were given 5mg/kg cyclosporine three times weekly. After 15 weeks, all rats were sacrificed, and tissue from each lobe of transplanted and native lungs was prepared for pathologic review. A board-certified pathologist then graded every visible airway on all slides on a scale from 0 (no BO) to 3 (severe BO) in a blinded fashion. Results: Comparison of LPS- and saline-treated animals revealed no difference in overall BO disease burden, defined as number of diseased (grade 1-3) airways divided by the total number of airways, in allograft lungs (p=0.949, by unpaired t-test). However, there was a trend toward greater BO disease burden in native (non-transplanted) lungs in LPS-treated animals than in saline-treated animals (p=0.119 by unpaired t-test). LPS also caused a trend towards inducing severe (grade 3) BO lesions (p=0.053 by X2 contingency table), all of which were found in the native rather than the transplanted lungs (p=0.014 by X2 contingency table). Conclusions: These data demonstrate that inhaled LPS alone, as a component that triggers the innate immune pathway, is not sufficient to induce BO in pulmonary allografts under the conditions used. The findings do suggest that exposure to LPS may play a role in generating a response in non-transplanted lungs in single lung allograft recipients. These observations merit further study and suggest that innate immune pathways in the native lung contribute to pulmonary pathology.